Cluster Spacecraft - Solar System Planets And Moons Section. Cluster spacecraft Give Each Other Some Room. An Artist's vision of the Cluster quartet. Image credit: ESA. The European Space Agency's fleet of 4 Cluster spacecraft put a little more distance between each other, during a difficult repositioning maneuver completed this week. Three of the spacecraft were separated to 10,000 km from each other, with the fourth moving 1,000 km away from the third. By shifting the distance of the spacecraft, from 100 km to 5,000 km, and now 10,000 km, scientists are able to study the Earth's magnetic field at different scales. This maneuver also marks the fleet's fifth year of operation. The four spacecraft of ESA’s Cluster fleet have reached their greatest distance from each other in the course of their mission to study Earth’s magnetosphere in three dimensions. This operation, marking the fifth anniversary of Cluster in space, transforms Cluster in the first 'multi-scale’ mission ever. In one of the most complex manoeuvres ever conducted by ESA spacecraft, three of the spacecraft were separated to 10 000 kilometres from each other, with the fourth spacecraft at 1000 kilometres from the third one. This new fleet formation for Cluster was achieved in two months of operations. The repositioning of the satellites was started by mission controllers at ESA's European Space Operations Centre (ESOC), in Darmstadt, Germany, on 26 May, and was run until 14 July. 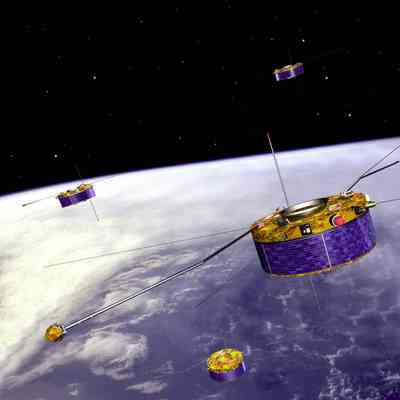 During the course of the mission, the distance between the Cluster satellites had already changed five times, in a range between 100 and 5000 kilometres. Varying the size - but not the shape - of the Cluster 'constellation’ had allowed Cluster to examine Earth’s magnetosphere at different scales. But now this new 'asymmetric’ flying formation is allowing the Cluster spacecraft to make measurements of medium- and large-scale phenomena simultaneously, transforming Cluster in the first ever 'multi-scale’ mission. With this, it is possible to study at the same time the link between small-scale kinetic processes of the plasma around Earth and the large-scale morphology of the magnetosphere. The knowledge gained by Cluster about the magnetosphere – the natural magnetic shield that surrounds and protects our planet – has already helped advance our understanding of how the solar wind affects Earth’s natural space environment. This is also important in our daily life as, for instance, intense solar activity can disrupt terrestrial communication networks, power grids and data lines.